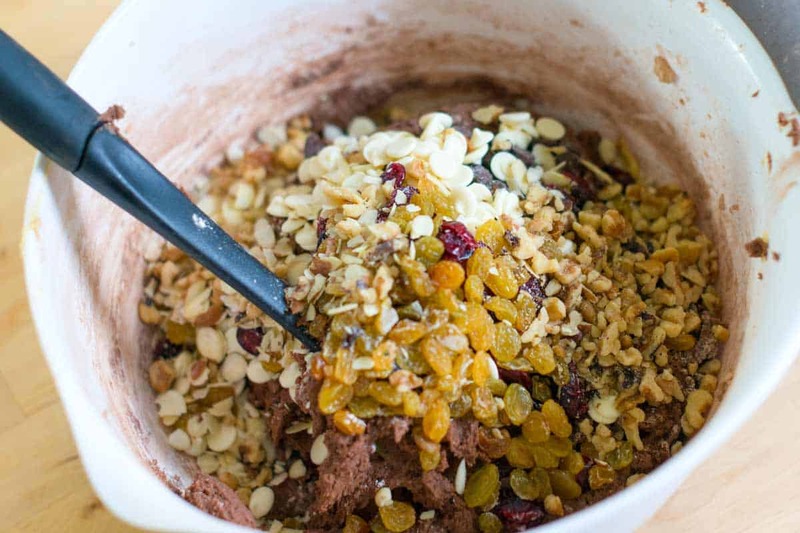 How to make chocolate cookies packed with chopped nuts, dried fruit and chocolate. 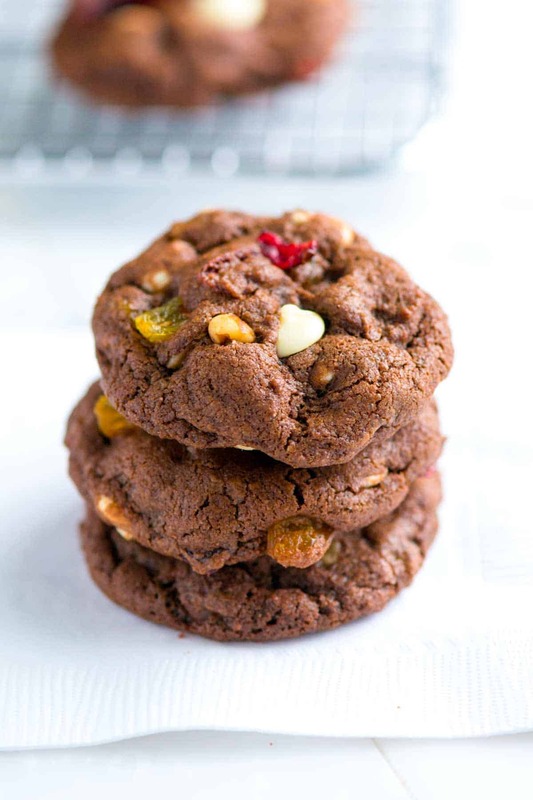 Jump to the Fruit and Nut Chocolate Cookies Recipe or read on to see our tips for making them. They were originally inspired by Joanne’s favorite chocolate bar: Cadbury’s Fruit and Nut Chocolate Bar. Each bite is a little different. Chewy and tart from the dried fruit, crunch from nuts and lots of chocolate. 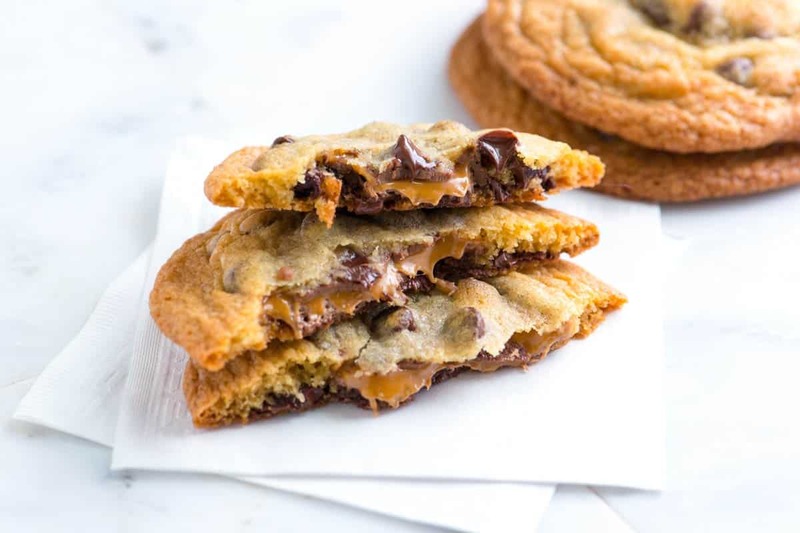 YOU MAY ALSO LIKE: How to make the best stuffed cookies with your favorite candy bars. Jump to the Milky Way Stuffed Cookies Recipe. The base of our fruit and nut cookies has been borrowed from our popular Chewy Double Chocolate Cookies. 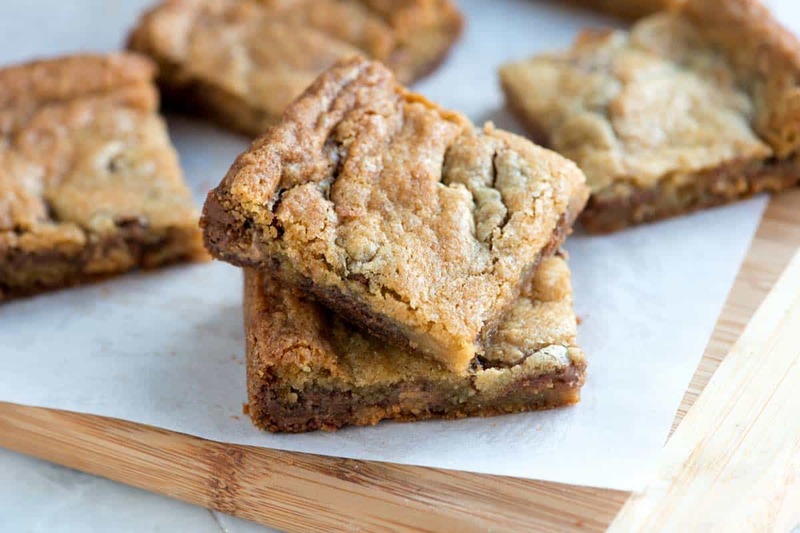 It’s one of our favorite cookies to date — the dough itself is addictive. There’s lots of wiggle room with these. You can add whatever you like. In fact, we’ve never really made the same cookie twice. This time we threw a bunch of things in: raisins, dried cranberries, walnuts, almonds, white chocolate and semi-sweet chocolate chips. These are perfect for clearing out your pantry. Just throw in all the partially used bags of nuts, fruit and chocolate. The cookie dough comes together quickly. 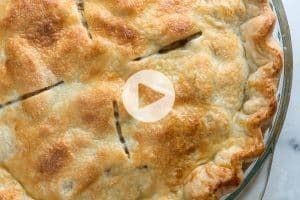 Butter and sugars are creamed together then a combination of all-purpose flour, cocoa powder and baking soda is added. Then we throw in the dried fruit, nuts and chocolate. Easy! 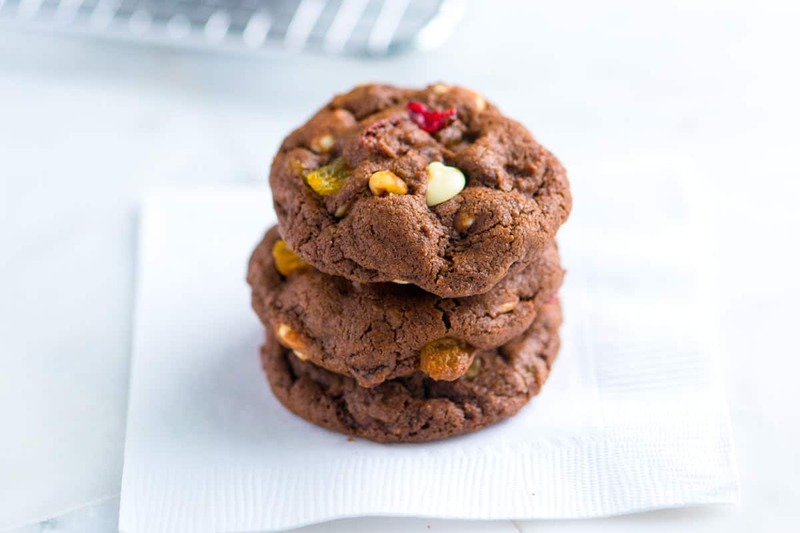 These chocolate cookies are packed with chopped nuts, dried fruit and chocolate. They were originally inspired by Joanne’s favorite chocolate bar: Cadbury’s Fruit and Nut Milk Chocolate Bar. There is lots of wiggle room with these – love dried cranberries and white chocolate? Add them. Prefer things to be simple with walnuts and chocolate chips? Great. These are perfect for clearing out your pantry. Just throw in all the partially used bags of nuts, fruit and chocolate. Preheat your oven to 350 degrees F. Line two baking sheets with parchment paper or use silicon baking mats. In a medium bowl, whisk the flour, cocoa powder, baking soda and salt together. 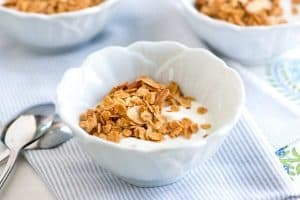 In a large bowl, using a handheld mixer on medium speed, beat the butter, sugars and vanilla together until light and fluffy, 3 to 4 minutes. (Or, use a stand mixer fitted with the paddle attachment). Reduce speed to low. Add the eggs one at a time, beating well after each addition. Scrape the sides and bottom of the bowl then add the flour mixture in three parts, just mixing until it disappears. The batter will become very thick. You may need to switch from the handheld mixer to a spatula. Stir in the chocolate, fruit and nuts. Drop heaping-tablespoon-sized mounds of cookie dough 2 inches apart onto baking sheets. (Or use a medium cookie scoop). Bake the cookies until the cookies have puffed a little and the tops look dry, 9 to 12 minutes. Cool on baking sheets for 5 minutes then transfer to a cooling rack to cool completely. Storing the Cookies: Baked and cooled cookies will keep, stored in an airtight container at room temperature for 2 to 3 days. Freeze Cookie Dough: Keep in mind that you can freeze this cookie dough. Line a baking sheet with parchment paper, scoop individual dough balls onto the baking sheet (they can be close together), and then place in the freezer until hard, about 30 minutes. Transfer frozen dough balls to an airtight container or plastic bag. Recipe tweaked from our Double Chocolate Cookies Recipe, which was originally inspired by Food 52’s Double Chocolate Espresso Cookies. 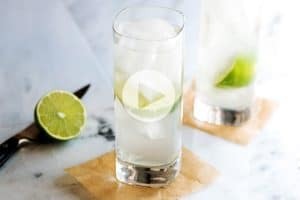 I’ve made this recipe half a dozen times or more. It is one of the very best cookies I’ve ever eaten and my friends and family agree. Delicious. Oh my word! 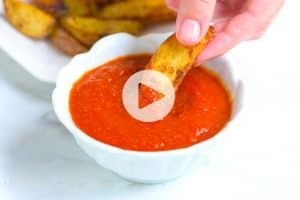 I can just imagine how soft and flavorful these are!